BCS Struts the Stage at SunPAC! When Brisbane City Sounds was invited to compete in the women’s invitational category of the men’s Barbershop Harmony Australia Sunshine Region Convention on Saturday 28 April, we were keen to participate as a practice run and dress rehearsal before our own Sweet Adelines Australia competition coming up in May in Hobart. Undeterred by the early start, as we were competing at around 9 am at SunPAC at Sunnybank, BCS members arrived in full costume and makeup – including false eyelashes – and performed our two contest songs for an appreciative audience. For some of our members, this was their first chance to sing on a concert stage with the chorus. This not only gave us performance practice on an unfamiliar stage, but also allowed us to perfect the many small details in costuming, makeup, lighting effects, choreography and stagecraft. We also met up with two of our sister choruses and saw them perform. We can’t wait to compete with them on the Hobart stage! 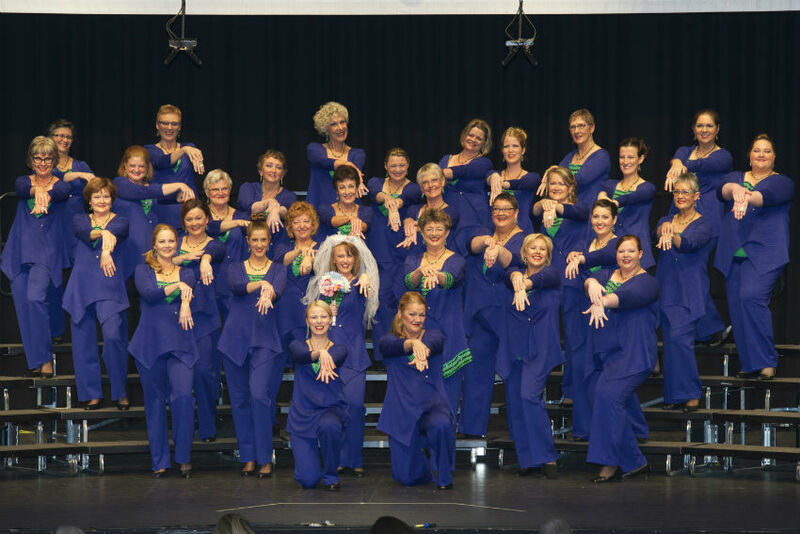 If you would like to watch our performance in Hobart, you can tune into the Sweet Adelines Australia convention webcast. Our performance time is 2.30 pm on Saturday 19 May. The webcast is free, but the region would appreciate any donation to help cover the cost.